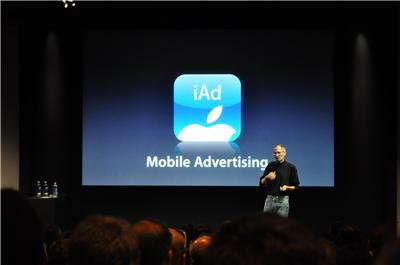 Today during its iPhone 4.0 developer preview, Steve Jobs announced Apple’s much-anticipated mobile advertising platform, iAd. This has been expected since Apple acquired mobile ad platform Quattro Wireless, after having AdMob snatched away by Google (though the FTC may recommend blocking that deal). Second, Jobs showed off an ad for Nike, which showed a history of Nike ads and allowed the user to actually flip through a history of the brand’s shoes. Ads will have access to many of the same APIs as ‘normal’ native applications — they’ll be able to use location services and the accelerometer. Location, in particular, will be important — this is going to be a boon to hyperlocal advertising (provided Apple offers a good way for local businesses to get their ads in the system). It sounds like Apple won’t be too restrictive on who can build apps: Ad agencies will be able to develop these interactive ads, as will app developers. 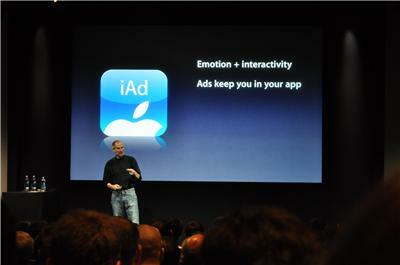 Though I imagine they’ll have to go through a review process similar to native apps on the App Store. Update: During a Q&A Apple said it would use a “light touch” and that there were obviously some ads they didn’t want to have shown, the same way a TV network doesn’t want some ads shown. The obvious consequence of this new platform is that ads from other ad networks may well become second-class citizens, perhaps not just from Apple’s perspective but from a functional standpoint. Details are still scant, but if iAds are the only ads on the iPhone that can access the iPhone’s API, then ads from third party networks may be less interactive, and may not be able to as effectively determine the user’s location. Assuming developers embrace iAds and the iPhone continues its strong growth, this could have a significant impact on Google’s mobile ad efforts in the future. The average user spends 30 minutes a day in apps. If we put an add up every 3 minutes, that’s 10 ads per day. We’ve all seen interactive ads on the web. We want to deliver interaction – but also emotion.